If you follow us on Facebook you’ve probably heard about how I am pet sitting for all my sister’s animals while she’s on vacation and you’ve probably heard how all her quail were attacked by a predator. All but 1 of her quail were killed. This guy is the only survivor and as you can see, in pretty bad shape. I strongly felt like I needed to give this guy a fighting chance, so I brought him home with me where I have been feeding him and hydrating him thru a syringe. His face is so scratched up that his eyes are swollen shut, he can’t see to find food or water and is too weak to do much more then stand. Every half hour or so, I feed him a concoction of food, water, probiotics, and electrolytes by mouth thru a syringe, 1 drop at a time. Most people would of culled him by now, but for some reason I feel like I can get him thru this. Maybe it’s just the guilty feeling I have because although this was by no means my fault, it happened on my watch and I feel awful about it. 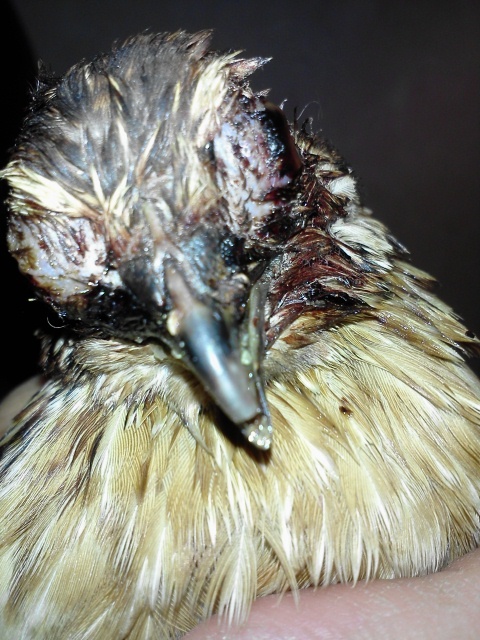 And, as I mentioned, her whole flock was wiped out but this 1 badly injured male. Maybe he won’t make it but I have to try. He has made it thru the last 36 hours which I am already surprised by. I really didn’t think he would make it thru the day yesterday, then I didn’t think he would make it thru the night, but he’s still with us so my efforts continue. I will keep you all updated on him. Heat Exhaustion – Heat exhaustion is common in large breed chickens; watch them closely in hot weather. Signs of heat exhaustion include: excessive panting, breathing with their mouth open, drooping head, listlessness and collapse. At the first sign of heat exhaustion, get the chicken inside immediately and put a fan on low, as birds can go into shock and die quickly. 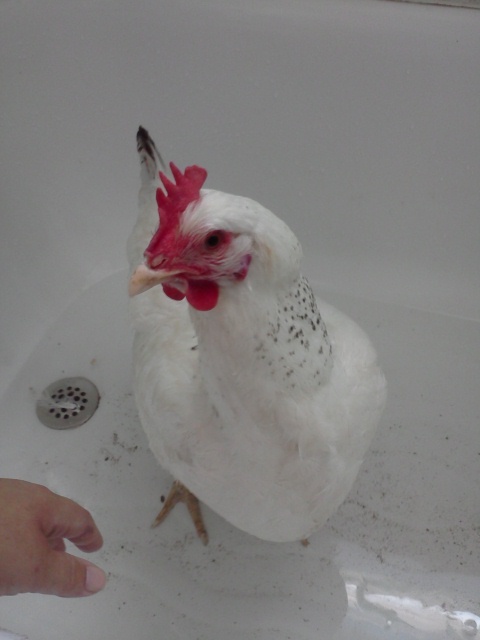 Mist the chicken lightly with cool water to help bring their body temperature down. Keep your bird quiet and calm and do not handle any more than necessary, avoid any added stress. Offer cool water with added electrolytes to help with dehydration. If after you’ve done the above and there is no improvement within a short time, contact your veterinarian. The picture is of my Delaware Grace, a large breed chicken. She is not very tolerant of the heat, she is the one that I keep a close eye on when the temps outside rise high during the summer months. She was very uncomfortable this afternoon so I brought her inside to cool her down a bit. What A Morning Around Here! Boy oh boy it’s been an eventful morning around here! Made the call to let Goldie, my Serama hen, out of isolation, had her in because I thought she was sick but now I don’t think she was, still not real sure but she seems healthy and she is her usual self, so back in the flock she is. However, upon letting her out she tried to go poo and seemed to be having difficulty doing so and then I discovered her vent was sticking out, she had some prolapse going on! She laid her egg and it was still out so back in isolation she went. I brought her into the house to treat her but had to deal with my 3 year old daughter and get my hands cleaned and supplies together to help Goldie, took about 10-15 minutes. Went to deal with the vent and was pleasantly surprised to find it corrected itself!! Phew!!! So now I’m still paranoid and keep going to check on her because I know it could happen again. I pray that it doesn’t. Then I went to my sister’s house to take care of her animals and birds because she’s on vacation and found that her Coturnix Quail fell victim to a predator last night:( Only 1 is left and he is in bad shape! To make matters worse, it’s forecasted to be another scorcher today! Stay Cool my friends!!! Ok, so there’s a lot of information out there on how to keep chickens cool, and if you’re a fan of several facebook farm pages like I am, you’ve seen just about every one post about keeping chickens cool in hot weather. Ever wonder what people way back when did to keep their chickens cool?? I have. My guess is, they did nothing and lost a lot of chickens to the heat. Chickens do not have the ability to sweat like we do, so they pant and spread their wings to help cool themselves. They also dust bath. Here in Southeast Michigan the weather forecaster says our temps are expected to be 96-100 degrees with a heat index of 105 today! That’s HOT!!! The chickens will not be happy!!! To help keep them cool, I put frozen water bottles in their waterers and fill it with ice. I also add extra electrolytes to their water. Extra waterers around the run are also a good idea. I put them by their dust bathing area so they have them close by. I also add frozen water bottles to the nest boxes because there’s a good chance that it’s even hotter in them. My flock also enjoys extra special treats of frozen fruit and veggies, they LOVE it!!!!! During the summer months all my fruit and veggie go straight to the freezer for extra hot days. A few dishes of crushed ice around the run is also a nice treat. Of course make sure there is plenty of shade. If their run is mostly sunny, add some beach umbrellas for added shade. I also like to add a small kiddie pool with just a few inches of water in it for those who are brave enough to try it out, standing in the cool water will help them cool off. An added fan is also nice and you can freeze a gallon jug of water to place in front of the fan, it’ll act like an air conditioner. There is so many tips and tricks of tried and true methods out there for you, but I can’t stress enough that an abundance of COLD water is the most important of them all! Chickens don’t like warm or hot water and won’t drink it! They can quickly become dehydrated putting them at an increased risk of heat stress and heat stress can and will kill your beloved feather friends. Stay cool my friends and while you’re taking it easy inside keeping cool, remember your friends outside that don’t have that option. Whether feathered or 4 legged, keep a close eye on them, heat stress can be prevented if you stay alert and watch them closely. A fan wondered if Silkies are hard to hatch. 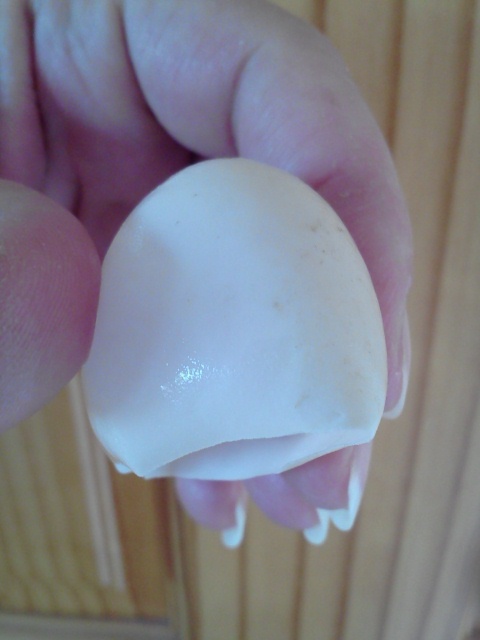 Answer: In my personal opinion from experience, Silkies ARE challenging to hatch. I have had several issues hatching Silkies and therefore no longer do. The issues I’ve had are death a short time after hatching for no apparent reason, shrink wrapping (when the membrane dries out and shrinks around the chick) Yes, for the record, my humidity was high enough, and splay/spraddle legs. If you have any suggestions, advice, or such that you would like to offer our followers, please leave them in a comment to this post. Thank You and Happy Hatching!!! Look at the rare egg I collected today! It’s almost pure white. Coturnix quail eggs are tiny white eggs with brown patches or spots on them. Sometimes they can have a blue tint to them or look like someone sprinkled them with pepper, they can also have a chalky appearance to them, and on rare occasions, they can be almost pure white. All these are normal traits of a Coturnix Quail egg. 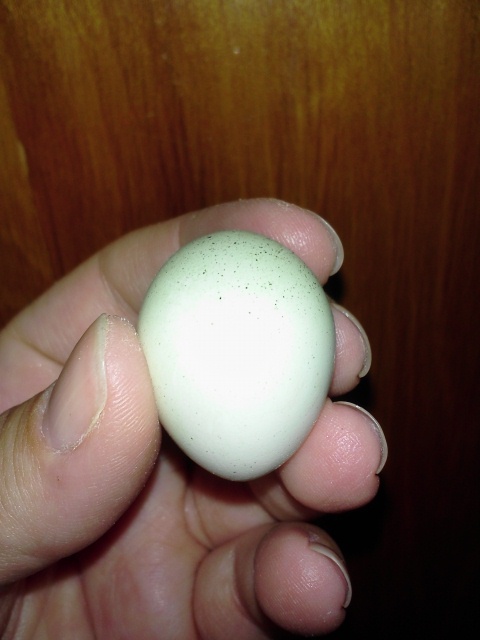 Yesterday I suspected that my young Isa Brown “Dolly” was going to lay her first egg. She spent much of the morning in the nest box “nesting.” I have 5 good egg layer pullets this year and I’ve been anxiously waiting for them to start laying. So to have 1 of them start is really exciting! After awhile, I found her first egg! A soft shelled small one (see picture). Soft shelled eggs are very common mostly in new layers. Their systems are still adjusting to the fine art of egg production:) If a hen is an established layer and lays a soft shelled egg, it could be an indicator that she has a calcium deficiency. Calcium is very important to a hen’s diet for nice hard egg shells. I offer my girls crushed oyster shell at free will. Some people prefer to use crushed egg shells. I do not offer them crushed egg shells because I’m too afraid it will encourage them to eat their own eggs, but many people do with no problem. If you choose to use the egg shells, be sure to clean them, dry them completely and I would suggest microwaving them to kill any bacteria that may exist before crushing and serving to your ladies. Yesterday I tried my hand at 2 yummy recipes I have never tried before. 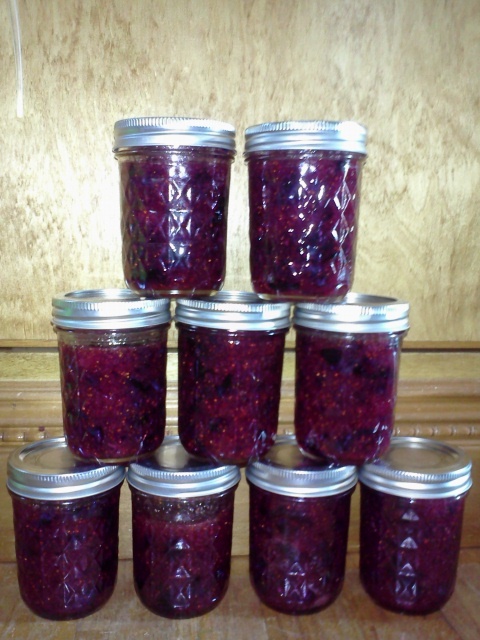 Blueberry freezer jam and oven dried beef jerky. The jerky was so scrumptious, we devoured it, it’s gone!!! The jam is still setting, but I can tell you the mixture was so good, my husband licked the bowl, with the help of myself and our son of course:) So I thought I’d share the recipes with you. Crush berries in a large bowl, add lemon juice and sugar, stir to mix well and let stand for 10 minutes. In a saucepan, mix pectin and water and bring to a boil. Boil, stirring constantly for 1 minute. Mix pectin mixture into fruit mixture, stir for 3 minutes. Pour fruit mixture into small canning jars leaving 1/2 inch headspace. Cover immediately and let stand at room temperature for 24 hours. Store in freezer. Makes about 6 cups. about 1 pound of beef, I used a small Roast but London Broil works great too. Mix above ingredients together. Slice beef against the grain thinly (this is easier done if beef is frozen) place in a ziplock bag with mixture, shake to evenly coat beef slices. Squeeze out all the air, reseal and let sit overnight. 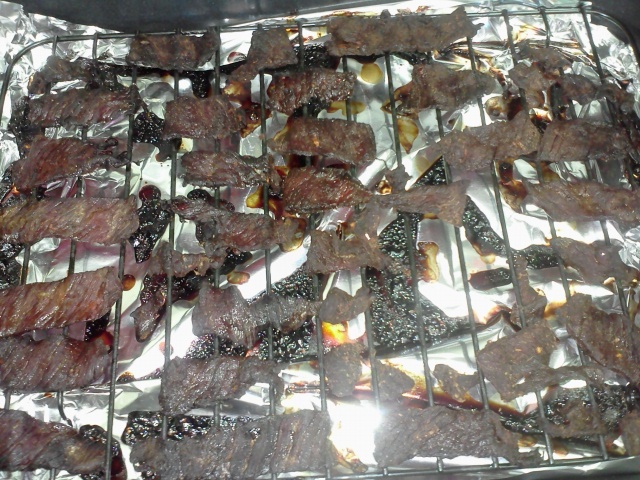 Once your beef has marinated over night, blot off marinade from each slice with paper towel and lay on a wire rack inside pan (I use a lasagna pan) but a cookie sheet would work too. I also line the bottom of the pan with tin foil for easier clean-up. Make sure beef slices are laying flat on wire rack and not overlapping each other. Bake in oven at 200 degrees until beef is leathery, about 2-3 hours. Let cool on rack completely before serving. Store in air tight container or ziplock bags. It’s finally a beautiful day! Weather is sunny and we’re expecting a high of only 73 degrees. Perfect gardening weather, at least for me:) We still are in need of a good rain, even a good thunderstorm to zap the garden and give it a growth spurt. Did you know lightning has that effect on gardens? It does. I’m going to plant more beans and peas because what I planted has been eaten by something. There’s alway something that gets eaten isn’t there! I am also going to spread some DE around the cabbage and broccoli because the slugs are in mass numbers this year and feasting on those as well. I’ll also use my tried and true method of watering the garden then sprinkling chili powder or cayenne pepper on the plants that pests love. It really works on keeping them off! How is your garden growing this year? Leave us a comment and let us know, we love hearing from you! CONGRATULATIONS to SARA SWEATMAN and ELIZABETH WHITE they are our 2 winners from our hatching eggs giveaway! Thank you to all who entered our giveaway! We sure enjoy and appreciate having you all be part of our world, sharing in our love for farm life!